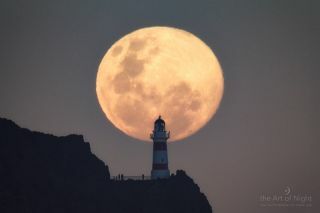 An astrophotographer captured this photo of the supermoon rising behind a lighthouse and some observers on Aug. 10, 2014. Photographers around the world ventured outside Sunday (Aug. 10) to snap photos of the bright, full "supermoon" rising in the night sky. August's full moon — called a supermoon because it is occurred when the moon was closest to Earth in its orbit — wowed skywatchers, inspiring some of them to turn their cameras skyward to catch breathtaking views of the biggest full moon of 2014. Some photographers had to wait for a break in the clouds to capture their images, while others chased the moon to different observing sites. Photographer Adam Nixon snapped this photo of the supermoon rising over downtown San Diego on Aug. 10, 2014. In San Diego, California, photographer Adam Nixon captured spectacular views of the supermoon rising over the city skyline, as well as views of bright moonlight glittering on the San Diego Bay. Sunday's supermoon was about 30 percent brighter and 14 percent larger in the sky than the smallest full moon of the year, which occurred in Jan. 16, NASA scientist Noah Petro told Space.com in a video interview. While casual observers of the moon might not have been able to notice a difference in brightness of scale during the supermoon, intrepid stargazers could probably see a slight change in the moon's brilliance, Petro added. The extra large full moon is actually the second of three supermoons occuring in July, August and September. The next supermoon will occur on Sept. 9. One night sky photographer, Giuseppe Petricca of Sulmona, Abruzzo in Italy, combined his images of the smallest and biggest full moons of 2014 to show exactly what the size difference looks like. Astrophotographer Giuseppe Petricca of Sulmona, Abruzzo, Italy photographed the biggest full moon of 2014 on Aug. 10, 2014 (a supermoon) and compared it to the smallest full moon of the year on Jan. 16, 2014, in this stunning view. "The difference is always stunning, and awesome too!" Petricca told Space.com in an email, adding that his comparison photo was made using the same camera shot settings and zoom to "assure the correct sizes and display." "From this comparison it's really clear even the difference in libration, just observe the crater Tycho!" Our own Executive Producer of the Visual Content Team, Dave Brody, caught the supermoon as a powerboat went speeding by over the Hudson river. The supermoon hangs over western Manhattan on August 10, 2014. During its full phase Sunday, the moon was about 31,000 miles (50,000 kilometers) closer to Earth than it is during its farthest point in orbit. On average, the moon circles the Earth from approximately 238,855 miles (384,400 km) away. "This is the largest, brightest, closest moon in 3.5 years, and it's happening the same hour in which it's full," Slooh Community Observatory astronomer Bob Berman said during a webcast about the supermoon on Sunday. "There's nothing not to like about this." Readers from the United Kingdom, Canada, Australia, Puerto Rico, the United States and other places around the globe sent amazing images of the giant moon to Space.com. Tim McCord, a photographer in Entiat, Washington captured an image of the moon glowing orange through a smoky haze. "No filter or photoshop," McCord told Space.com of the red glow via email. "True color of what the moon looked like." Astrophographer Tim McCord captured the supermoon rising in Washington on August 10, 2014. He caught the moon glowing red through a smoky haze. A trick of the eye called the "moon illusion" makes the natural satellite loom larger when it is close to the horizon. Photographers can use this shift in perception to their advantage by catching the horizon-hugging moon with other objects, creating beautiful, unreal looking images. Astrophotographers snapped images of the supermoon glowing behind a bat, a cactus and a speedboat. The moon typically looks full a day or two before and a day or two after the cosmic body actually turns full phase. This reporter caught sight of the moon from Fire Island, New York on Saturday (Aug. 9) before it hit full phase the next day. The bright moon washed out the sky, lighting up the night to the point where streetlights barely seemed necessary and only the brightest stars could be seen. Editor's Note: If you snapped an amazing lunar photo of the "supermoon" full moon in August and would like to share it with Space.com for a gallery or story, you can send images and comment in to managing editor Tariq Malik at: spacephotos@space.com.